Madeline Buck is an experienced athlete having competed for Namibia in Show Jumping and Dressage equestrian sports, and has experience competing in basketball, volleyball and fastball back in Canada where she originates. Most recently Madeline hiked to Everest base-camp and has a future focus on climbing to the summit. 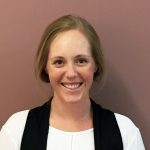 Kalamunda Physiotherapy Centre welcomed Madeline in 2014 and she continues to demonstrate her keen interest in sports by being a physiotherapist and sports trainer for the Australian Men’s Curling team, as well as several Rugby teams in Perth. Madeline has also worked alongside physios in Namibia, Africa with a focus on neurological rehabilitation by taking part in Hippotherapy (physical rehabilitation with horses). Passionate about providing quality care, Madeline uses evidence based rehabilitation techniques so you can reach your functional, lifestyle, and/or sporting goals. She is often seen taking Arthritis Pool Classes and Fit for Life Classes in the gym.